Occupational Therapists (OTs) are allied health professionals overseen by the Royal College of Occupational Therapists and Health and Care Professions Council. OTs are trained to a graduate level, with many going on to gain post-graduate specialist qualifications in their chosen field of practice. They have training and knowledge of the medical, physical, psychological, cognitive and social causes and consequences of a disability. As defined by the RCOT, Occupational Therapy provides practical support to empower people to facilitate recovery and overcome barriers preventing them from doing the activities (or occupations) that matter to them. This support increases people’s independence and satisfaction in all aspects of life. “Occupation” as a term refers to practical and purposeful activities that allow people to live independently and have a sense of identity. These are essential day-to-day tasks linked to people’s self-care, work or leisure activities. Most OTs start their professional practice within statutory services for the NHS or Local Authorities. Often after a couple of years of work, OTs choose to specialise in working with either adults or children and young people. OTs work in a variety of settings including acute hospitals, acute rehabilitation and community services. In these settings OTs deliver treatment for rehabilitation of skills and function, vocational rehabilitation, splinting, advise on environmental/ home adaptations, advise on the use of assistive technology or the prescription of supportive equipment such as wheelchairs and seating. Many OTs specialise in one of these areas. Overall, the OT is skilled at assessing the client’s level of functioning in their everyday life. They will identify the barriers to the client’s function, lifestyle and roles and make decisions about whether to accommodate limitations by adapting the environment and ensuring others around the client are supporting them effectively, or to set rehabilitation goals to treat and develop skills and function. The client’s own goals and aspirations are the focus for therapy. For individuals who have sustained a brain injury, the role of OT can be diverse and also highly specialised. There is a science to delivering therapy by using evidence-based neurological treatment approaches, but it is also an art; to build approaches that are a good fit for the client’s motivations and aspirations and sensitive to their cultural and lifestyle needs. 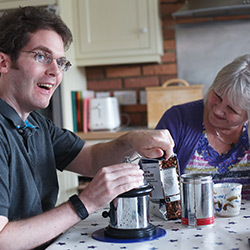 For example, your client might need to have different OT specialists involved in delivering a treatment plan for: upper limb rehabilitation, executive functions and developing daily living independence; for adapting the home and advising on assistive technology and moving & handling; to prescribe and maintain a specialist wheelchair, seating and sleep system; in delivering a Vocational Rehabilitation programme. Paediatric OTs often have great experience in working alongside schools, colleges and families to deliver rehabilitation programmes. Some OTs will have skills and experience covering several specialities, which may ultimately reduce costs for your client. OTs are great problem-solvers and often find that their skills transfer naturally to Case Management. Facilitating a client’s independence and understanding how people live and work together are core skills for an OT. In a client’s journey through litigation, it is likely that they will encounter several OTs along the way. Catherine is a Paediatric Occupational Therapist and clinical lead at Brain Injury Group associate members ILS Rehabilitation Solutions.